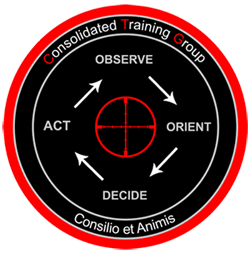 Consolidated Training Group believes like life, firearms training should be multi dimensional. Although every dimension of training has its own intrinsic value, being able to be instructed in, and then use, every dimension during a confrontation, hunt, training or competition substantially increases the probability of a positive outcome. Our training philosophy maximizes the use of proven techniques through the below listed 4 dimensions. This is done to create a safe, challenging and productive learning experience. The training may be completed at one of our selected training facilities or at a qualified location requested by the end user. Every participant in all courses offered by Consolidated Training Group LLC must be able to legally possess a firearm under State and Federal Law.